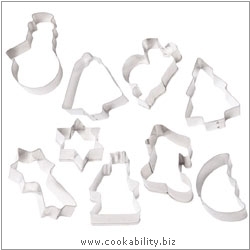 Set of 9 Christmas Cookie cutters. The top side has a finger safe folded edge. Includes Sleigh, stocking, bell, present, angel, santa hat, bright star, holly leaf, xmas tree, but may vary and mix a little different to that show. Most between 5 and 8cm. Supplied in acetate santa box.